Jonathan Ross is the pseudonym of prolific British writer and former Detective Chief Inspector John Rossiter born in 1916 and apparently still alive at the age of 101. I believe though, that his last book in this particular series was written in the late 90's. I happened across his books at my old local library when I lived in N.J. They were a happy surprise, for I'd almost run out of mystery and thriller writers to read (or so I'd thought) at the time. Little did I know then that thanks to my handy-dandy computer, I'd soon discover many other wonderful writers I'd never heard of, much less read. 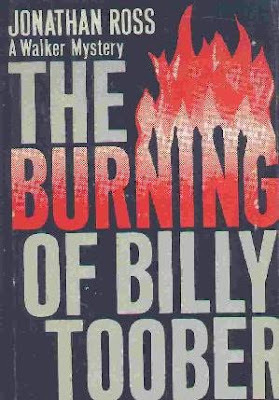 THE BURNING OF BILLY TOOBER is a decidedly noir entry in a series that seems to have been overlooked or forgotten by nearly everyone. It is one of the grittier and grungier of Ross's engrossing police procedurals set in London (of the 1960's - 1990's) and its environs. The nattily dressed and perpetually randy Detective Superintendent George Rogers and his crew are back once again to solve the murder by incineration of Billy Toober, a police informant and small time crook. The book has a terrific opening hook: His mother loved him. So did his brother. It was impossible to believe anybody else could. Billy Toober had been hoping to evade the retribution of Roy Grattan, the crime boss he helped send to prison. But when Grattan's brother - a violent tough known as Dummy - a large, afflicted sort who can only communicate by grunting or garbling his words - is sent to teach Billy a lesson, Billy turns to Detective Superintendent George Rogers for help. Rogers, not the comforting type, tells him he can do nothing. The next day a body is found in the park, burnt to a crisp. This particularly grisly murder sets off several other killings which will keep Rogers and his minions busy as they try to untangle the plots and ploys of London's sleazier denizens. A job made all the more onerous by the actions of a mother bent on grim revenge. In between, Rogers must contend with the sordid mess he's made of his own personal life. He is not, by his own words, "...a very practised adulterer." But that won't stop him trying. He is currently involved with Dr. Bridget Hunter, the Medical Examiner. Rogers' wife - no fool she - suspects the worst. While reading several of the books in this series, I've often wondered what it is that women see in Detective Superintendent Rogers. He's a good cop, but he is relentlessly unsparing, "...bloody-minded and destructive..." and inclined to occasional bouts of self-pity. But there has to be something about Rogers that women like; he does get an awful lot of them to fall for his hidden charms. "Bigger men that you, George, have told women they love them"
He tried to recollect some who had and couldn't. "I don't believe it," he said cynically...."I'm sorry...if it's any consolation, I've never thought of any woman in terms of being in love." Although his infatuation for her was no perfunctory passion, neither was it deep-rooted. His stubborn honesty refused the easy solution of telling her he loved her; women did it as a matter of course, to whitewash promiscuity. And there was still the ridiculous stumbling block of picturing himself as a lover and an adulterer. Astronauts, rent collectors, gynaecologists, insurance salesmen and company directors; he could imagine them all in situ without loss of dignity. But not, somehow, his own grey-suited persona as a Detective Superintendent. Of course, a man of George Rogers' blunt caliber will make enemies, and he has a couple down at the cop shop. Rogers must daily grit his teeth and hold his bile while waiting for his immediate boss to retire - one year to go! - not an easy thing when your inclination is not to suffer fools lightly. Still and all, there's just something about Rogers that eventually gets under your skin. There's much to be said for the attractions of a competent cop. But I still shake my head at all the women. THE BURNING OF BILLY TOOBER, the sixth entry in what was a long-running series, has an unexpected ending which is really a cynical fillip to motherly love. This is another compelling police procedural in a long string of terrific books by Jonathan Ross and certainly worth looking for. To see all the titles in Ross's series, please go here to his fantastic fiction page. It's Friday and this week, Todd Mason is doing hosting duties at his blog, Sweet Freedom. Don't forget to check in to see what other forgotten or overlooked books other bloggers are talking about today. In the interest of fair disclosure, this post is a re-working of a review written several years ago. I thought it was about time to bring up Jonathan Ross again. I ran across his name recently and reminded myself that I still needed to read a couple more. I was surprised that I liked these as much as I did, Mudpuddle. Not my usual fare. But that's the fun part of reading - you just never know what you'll stumble into. Sounds really good Yvette and not the kind of book I would have thought would normally appeal to you - but be really good! Thanks chum. I imagine in an earlier day George Rogers would have been known as a cad. He'd best watch his back, or he might end up burnt to a crisp. Fun review, Yvette. Oh he IS a cad, Mathew, definitely. But still a good cop who gets the job done. Rogers ia a man without much sentiment, but call me contrary, I still liked him. This does sound like an interesting series, and I have not heard of this author. I will be seeking some of his books out. It looks like one can find affordable copies. Nobody seems to have heard of this guy, Tracy. Very odd. I'm actually surprised there don't seem to be any e-books. But used copies are dirt cheap. I'm currently on a vintage reading binge and fast running out of space once again on my bookshelves. Pretty soon, I'll be having to buy another shelf or two - though where I'll put them - who knows?